So, I know you have seen lots of beautiful quilts out there, but this one is my first real quilt. 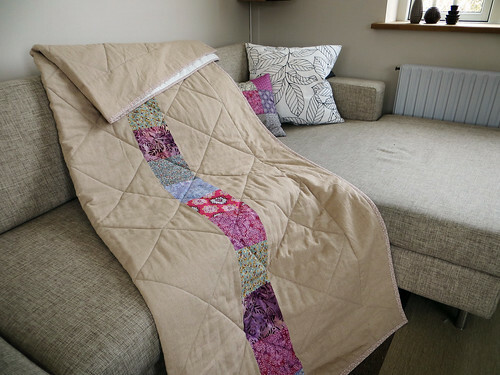 I made small quilts before – you’ve seen them here and here. I have been working on this one whenever I had the chance (and the energy) the last three weeks. We do have some busy days at the moment, so finding the time has been the hardest bit, but hey, it’s finished. I have the funniest little patchwork-lover in Frida. She loves everything I make in this style – I made her a hexagon patchwork pillow (also found here), and it is a clear favourite of hers. 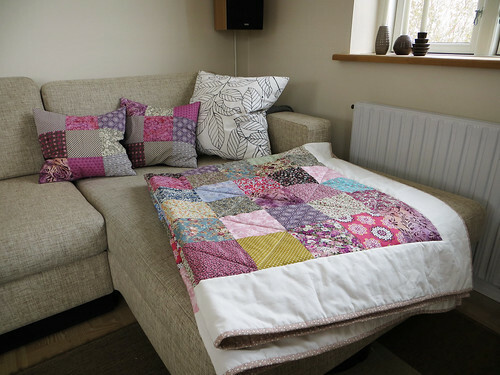 Then I made the pillows for the couch – immediate favourites. And now this quilt. Same story. She wants me to make her a twirly patchwork dress, so maybe that will be a summer project. Funny Frida. I have been home sick for a few days, so today I took 5 minutes to take a few pictures of it – instead of cuddling up under it. 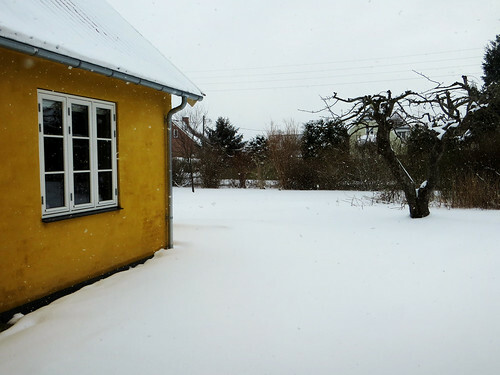 I would have taken it outside to hang for you to see it clearly, but since this below is the current state of the great outdoors this spring, you will be seeing pictures from inside instead. The quilt is 165 x 195 cm, and it’s made using 135 squares. I backed it with linen, and quilted it diagonally. I have used all kinds of fabric that I had in my stash already – Liberty, Kaffe Fassett, and several other things. I would be able to make quite a pile of these using my stash only – can you believe that? 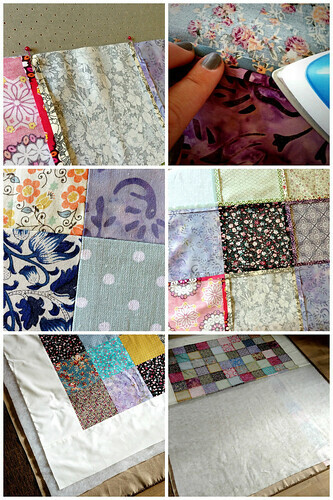 I used 505 fabric glue to assemble the layers before quilting – I read that people have different opinions on whether to use pins or glue, but the glue worked fine for me, I think. 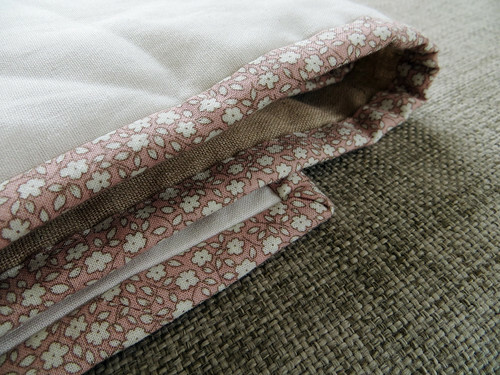 The binding is made in a floral fabric from Stof & Stil. As mentioned, I backed the quilt with linen, and since I couldn’t get the linen wide enough for the quilt, I came up with the idea of adding a row of squares on the back as well, which I think works quite well as an extra detail. I looked to YouTube for some help with the binding. There are lots of good tutorials on binding and mitered corners, and I actually used a combination of a few. This one is long and pedagogic (and there even is a part 1 as well), but I like the way she joins the ends after having attached it all the way around. This one is thorough but quick, but try searching and you will find a 100 more that could probably just as well be used. 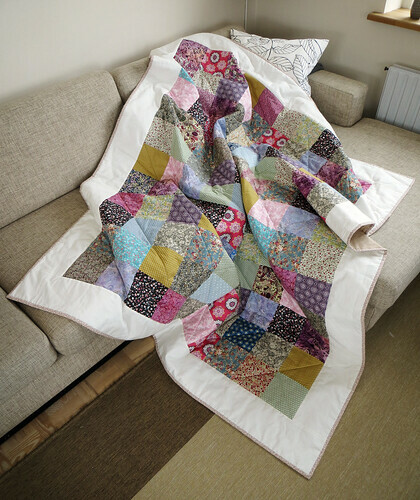 This entry was posted in Sewing and tagged binding, blanket, Kaffe Fassett, large quilt, liberty, mitered corners, patchwork, patchwork blanket, quilt, quilt blanket, scandinavian, squares. I love your quilt! I think I am on Frida’s side here! I got my sewing machine out for the first time ever last week and made the Scrappy Ipad cover designed by My Poppet and made out of squares of old jumpers. I am now trying to make Star War’s Chewbacca soft toy designed by Draw Pilgrim. I have discovered that whilst I can sew in a straight line quite well I am not very good at going round corners! Thank you! 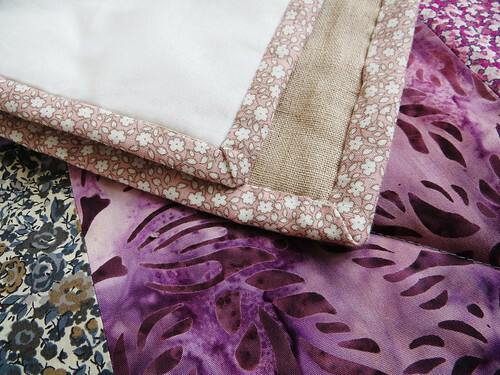 The iPad cover is really soft and has had many admiring glances – enough to inspire me to use my sewing machine more! Beautiful colours, and I like the fact that the border is the same width as a square – it works really well. Beautiful quilt in colors I absolutely love! I am a Norwegian currently stationed in West Africa, and this beautiful quilt brought me right back home, even if just for a moment. I came across your blog on pinterest, by the way, and you have lots of lovely things! I’ll be back later! hello…your quilt is quite lovely! Did you use the back side of some of your fabrics for a more subtle look? I have done that myself a few times and it can add a bit of interest I think. Good luck with your future quilting endeavors…you’re on your way! !